Tunable-white lighting is one of the biggest trends in commercial lighting. LED developers have taken a serious grip on the photo-biological research being produced by university departments and other groups. We know more about the way that humans function than ever before and you might say that it’s fortunate for the LED community that the science appears to support a practical technology that is perfectly suited to LED exploitation. Standard LED colour-mixing uses red, green and blue channels that are adjusted to deliver the entire range of the colour spectrum. Tunable-whites work in the similar way, using of a number of controllable channels to adjust the colour temperature of the luminaire’s white light output. The channels in a tunable-white system all produce white light, but with varying colour temperatures, from a warm tone to a cool tone. Inevitably, there are levels of sophistication involved in tunable-white systems and it’s vital that the specifier understands not only what is required from the lighting, but also what any particular system is capable of delivering. Take a warm white LED and sit it next to a cool white LED and cross-dim between the two. Job done? Well, not quite. It’s true that the cheapest tunable whites work in exactly this way. The most basic tunable linear systems use LED strips mounted side-by-side. One channel will be close to 2700K in colour temperature, with the other up around a cool 6000K. The LED strips are mounted inside an aluminium extrusion fitted with an opal diffuser, which does the colour mixing as the light passes through it. It’s very simple engineering but satisfies a basic market with low performance expectations. More products are using ‘multi-chips’ where a number of tiny LED chips are combined into the same module. This means that the colour mixing occurs as the light leaves the module. Their very small size means that tunable-white products can be made much smaller, so we’re starting to see downlights using the technology as well as linear systems. These multi-chips tend to have a higher performance specification than the individual LED strips, but nothing should be left to chance. A lot of fuss is made, quite rightly, over the way that white light presents surface colours. We’ve come to expect a good quality of colour rendering, regardless of light source. Tunable whites are not exempt from this issue but it’s not always clear from manufacturers’ data how well a system is performing. Cheaper products may advertise good colour performance at the extremes of the tunable range, where light is being delivered from either the warm or the cool channel, but there’s no certainty that the mixed light performs equally well. Generally speaking, the greater the number of channels, and systems vary from two-channel to five-channel, the better colours will look under them. 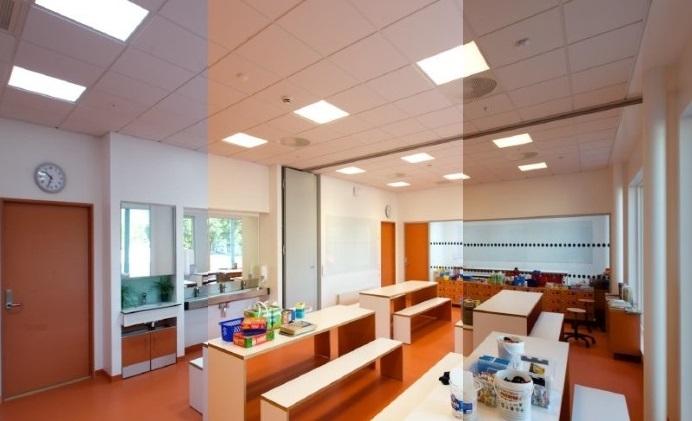 If there is one aspect of tunable-whites that the specifier needs to take great care over, it’s the colour temperature range that’s on offer. While some systems offer a wide natural ‘circadian rhythm’ range that shifts from candlelight to daylight, there are other systems with a much smaller range, from 2500K to 4000K, which should only be considered as a decorative option. The simplest systems use manual control to alter the white outputs. Expect to see a wall-mounted control panel or a hand-held remote control that enables you to adjust the colour of the light and the amount of light output. There is nothing scientific about this. It’s left entirely to personal preference, which may – or may not – be a good thing. Some tunable controls are designed to replicate the effect of dimming on a filament source, where two things happen at the same time. As the light output is dimmed, the lamp warms up in the same way as a traditional tungsten filament lamp. This is still a manual control method, but has the benefit of mimicking a filament light source. The tunable range tends to be very small, again mimicking the conventional tungsten lamp. More sophisticated control strategies are designed to manipulate the circadian rhythm of room occupants. This means that the lighting settings are programmed into the control architecture. Shifts in colour temperature and light level can be pre-set or can be instigated by a manual over-ride. This is the method that’s being used in recent school installations in Scandinavia. It’s been pointed out that not all ‘tunable-white’ mixing requires a full colour range. Complex tunable-white schemes mean that you should be able to call up any colour temperature within the mixing range. But some clients will call for specific colour temperatures, often those that are commercially available, such as 3000K, 4000K, 6500K. If that’s the case, then it may be simpler – and cheaper – to consider having three discrete lighting channels operating separately within a bespoke housing.